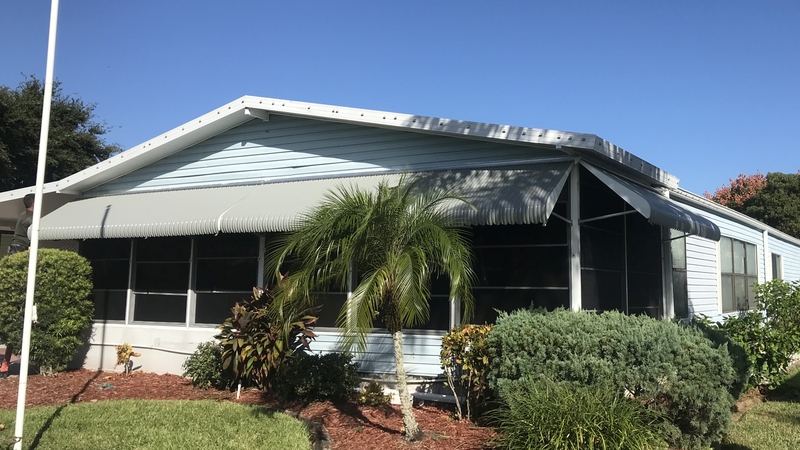 The custom extra wide aluminum clamshell awning installation shown in the photograph here was for a new customer in Cocoa, Florida. The project includes 3 awnings on the front patio of the home with one small awning on the side and two more installed along the front. Having a shade solution the length of the porch front divided into two makes it easier for the owner to put up/down for storm protection. Trust Haggetts Aluminum for a custom designed awning, carport, or screen room for your mobile home. Call 321-978-5500 for a quote.